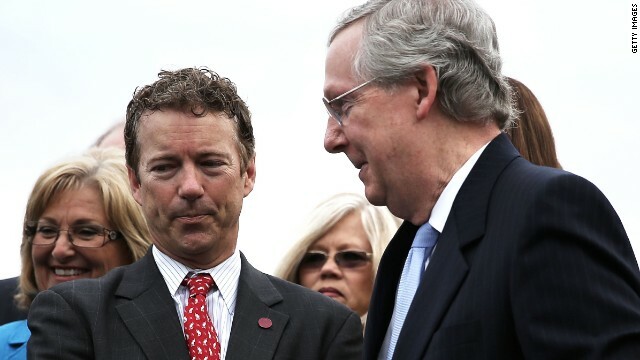 (CNN) - Rand Paul is defending his relationship with Mitch McConnell after helping his fellow Kentuckian defeat a tea party-backed challenger in a GOP Senate primary. "I came out of the tea party movement. I'm very concerned about the debt. I'm very concerned about big government," Paul said on Friday. "But I think the misnomer is to think somehow Senator McConnell isn't. That's what his whole entire career has been predicated upon - fighting against big government." The comments by Paul, the state's junior senator, came at a news conference with McConnell in Louisville that was focused on building party unity following a bruising campaign in which the minority leader's opponent, Matt Bevin, got 35% of the primary vote. Some in the conservative grassroots movement immediately called for Republican voters to unite and support McConnell. But Bevin has been noticeably quiet and hasn't said whether he'll back his rival–though he flatly stated on election night that he won't back the Democratic nominee. That's not stopping Alison Lundergan Grimes, however. She's actively going after Bevin supporters. In an open letter Friday to the 40% of Republican voters who didn't vote for McConnell, she argued that a vote for Grimes is a vote for change. "Yes, we are in different parties, and we have divergent views on some issues. But if you believe that we need a fresh face to shake up Washington, I invite you to join our campaign," the letter stated. Bevin hit back later Friday with his own letter, saying she doesn't understand "the principles that united my campaign's supporters" and disparaged her stance on a number of items on her agenda. He agreed with her that Kentucky needs change, but not her kind of change. He made no direct mention of McConnell in the letter. Come fall, Paul argued that those who identify with the tea party movement will rally behind McConnell to thump Grimes. But one of the biggest storylines in the primary was Paul's support for McConnell, who famously backed Paul's opponent in the 2010 primary. The two made amends and McConnell supported Paul in his general election victory. While they don't always align on issues, Paul on Friday dismissed the notion that he and McConnell clashed on Republican ideology. Paul noted they've voted the same 87% of the time and they've co-sponsored 144 bills. "Are we exactly the same? No we're a little bit different. In fact I think he was right 87% of the time," Paul joked, putting his hand on McConnell's back. "He may think the opposite–that I was right 87% of the time." Paul is making it clear that he intends to campaign heavily for McConnell. Asked at the event if McConnell will return the favor should Paul run for president in 2016, the Republican leader said "First thing's first." "We have one in 2014, and then we have another one, and we'll discuss that at the appropriate time," he said. Rand Paul is defending his relationship with Mitch McConnell , I think the misnomer is to think somehow Senator McConnell isn't pro Tea ,That's what his whole entire career has been predicated upon – fighting against big government." in Support of " Big corporate fraud "
It's Time For Kentucky To Elect A Woman ! When someone goes along with a vote that benefits liberals and not conservatives, just because it is a holiday break, and he wants to go on holiday..........he is NOT conservative enough for me. Why did Rand Paul and Mitch McConnell sell out to Big Pharma ? Why do we need more powerful painkillers on the market ? Why won't Paul and McConnell pass bill to make it harder to buy chemicals to make Meth ? How Many more Addicts must die , How many more families ruined ? A new narcotic painkiller is due to come on the market in March, and critics want the FDA to reverse its approval of the drug, Zohydro ER. Both Paul and McConnell approve of Zohydro sales . I'm concerned that THAT is what he needs to clear up for us. I'm more worried about how corrupt McConnell is as opposed to how conservative he is. --doesn't this nation know that both are from stupid Teaklan thugs of the century. How would any one even consider these two idiots. Karma. "Jerk" would be more appropriate. If you walk and talk the party line you are a Republican/Conservative. If you actually think for yourself and actually support what is best for the people you are a RINO. That logic is as deeply flawed as it is obviously simple. Well this is all politics. Paul knows that if the Tea man would have gotten in, there would have been no chance of winning, whatsoever. I hope this Dem lady trounces the old fart McConnell in November! Paul needs to realize that his base does not know the definition of big words like "misnomer". Paul needs to stick to the three and four letter words Conservatives stick to and change "misnomer" to "lie". Luckily; Paul did not call it an "incongruity". Using this complex of a word would cause many Conservatives to blow their low amp fuses. If you're that worried about the debt and big government then you shouldn't want anything to do with Democrats OR Republicans. The anti civil rights curly top vs/for the make Obama a one term president and obstruct, obstruct, obstruct ALL and everything. What a "pair" (or four) of nothing's. What a gift to the Democrats if nutty Rand gets the nomination. Few people would argue the fact that both are pretty much out of touch with the people. Also, they are much more adversarial than they'd admit in public. The one outstanding thing they do have in common is their affinity for party politics, over the desire to serve the nations best interest. Not sure why Grimes is bothering appealing to the teapartiers. That's like offering treats to a rabid dog. The dog can't understand what he's being told, you'll likely get bit, and he won't eat the treat anyway. Hmmm Rand is weak on security from terrorists... he is weak on immigration laws... he is weak on defense..